Facebook’s glory days are fading. Yes, it’s true. The giant of social media has gotten, well, crowded. Parents are on it, grandparents are on it, and employers use it to decide whether to hire someone. For the rest of us, it’s time to find a new playground. Many have found this in Tumblr, a blogging and picture based social media website. 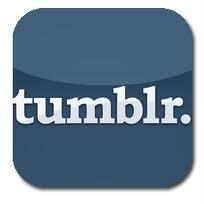 Tumblr is much more informal, and one can be as secretive or as intimate as you may desire. There is no pressure here to add all of your family members, the kid from math class, or your dentist. And unfortunately for Facebook, Tumblr is more fun. Users are rarely bombarded by ads, or asked to join groups or play any sort of Farmville-type games. 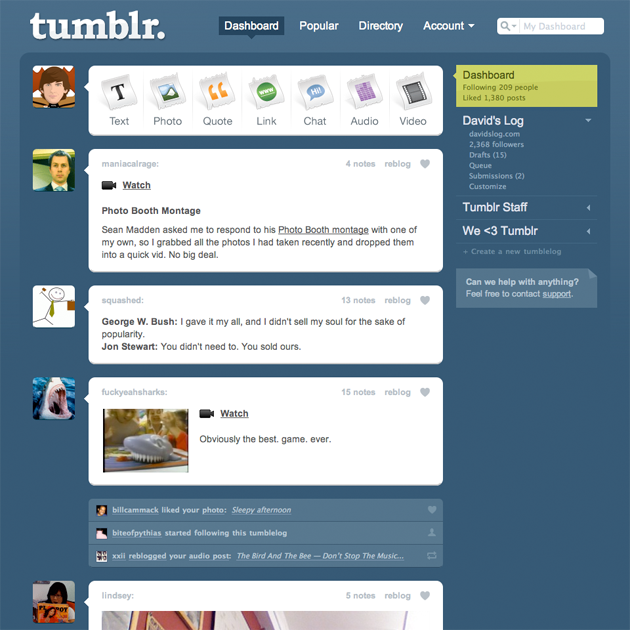 Members of the Tumblr community often poke fun at each other and themselves, which helps make the website feel nonthreatening. Users often lament their exaggerated bad habit of staying online all day and all night, making anyone who reads the post feel a little better about their own over-use of the computer. You stay up until 4am watching re-runs on Hulu too? And of course, they make fun of Facebook, mainly for the previously mentioned reasons. Its too boring, too old, too frumpy, too packed-full of a million different things happening on the sidebar. Tumblr is also full of rants on every topic available. Users write essay-length comments and responses on topics ranging from the seriousness of abortion to the silliness of different Hogwarts house characteristics. It certainly is a fun and easy way to find other fans of books, movies, and TV shows. Finding someone on Facebook who also happens to like Green Day, Shakespeare jokes, and Sherlock Holmes would be far more challenging than on Tumblr. There is a sense of community on Tumblr that Facebook does not have and probably will never be able to attain at this point. Facebook got very big, very fast, so there is no sense of a unique space because everyone is already there. Tumblr is the new alternative. That is the way of social media, for a while, Myspace was king, and then fell to Facebook, which itself is now going downhill. Facebook is clearly going to have to step-up its game to stay on top. With the uprising of Tumblr and other less-well-knowns, as well as dissenters complaining of Facebook’s frequent changes (the new Timeline feature is not going over well) and controversial privacy rules, the giant is in trouble.